Dental bridges are a good choice to replace missing teeth. Using your existing teeth, a bridge, made from gold, metals, porcelain or alloys is created, spanning the missing tooth area. Bridges are strong and durable, and can improve the look of your smile and boost your confidence. Dental bridges are designed to restore health, function, and aesthetics for one or more consecutive missing teeth. 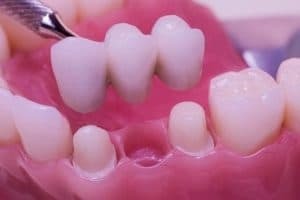 A bridge is a prosthetic tooth that is attached to dental crowns anchored in place by the surrounding teeth or connected to dental implants. Our offices use the top rated dental laboratories to create these prosthetics with the skill and care your smile deserves. A bridge begins by altering your existing teeth into what is called an abutment, or the porcelain bridge’s base, where it will securely attach. Once the abutments are created, a mold is taken of the area and sent to a dental lab. This mold is used to create a properly-fitting and natural-feeling dental bridge. While waiting for the lab to complete your dental bridge, we are happy to fit you with a temporary bridge, which is designed to protect your gum area and will be and temporarily conceal your missing tooth. At a follow-up visit, the bridge is placed on the abutments and an adhesive is used to permanently set the bridge in place. After your bridge is in place, it is important to limit your diet to softer foods for a few days. Once a few days have passed, you are free to eat anything you desire without worry of the bridge, which will stay firmly in place. Although it may take a while to get used to your new bridge, after a few days it should feel like having your own teeth back again. What is the difference between bridges and dental implants? A dental bridge uses two dental crowns to support a false tooth or multiple teeth between the crowns. The false tooth/teeth supported by the crowns is not connected to the gums below. On the other hand, a dental implant is secured into the gums and replaces the tooth’s root in addition to the visible portion of the tooth. Bridges are a good choice for dental repair, however, you may want to consider a dental implant. Speak with one of our knowledgeable staff members at Dental365 to determine the best solution for you. What are the benefits of having dental bridges at Dental365? Contact Dental365 for a consultation to determine if a bridge can help restore your smile. Call us today at 844.365.DENTAL or request an appointment through our website at any time.